A drone being prepared for a habitat mapping operation. When police seized a drone that recorded the Hambantota port protests last week, it renewed the debate on whether to welcome this ‘new kid on the block’ or to ‘rope him tightly’. While few view drones as a menace, their applications in different fields can open up new opportunities that had not been previously thought of. Professionals in different fields welcome this new kid on the block while recognizing the need to ‘discipline’ it. Dr Eric Wickremanayake, a conservation scientist of the World Wildlife Fund, points out that drones can be used in protected areas to map habitat, monitor traffic, and track illegal activities. A drone is an unmanned aerial vehicle (UAV) that can be remotely operated and transmits video and images. Infrared sensors can be used for different applications.Drones have been used over decades specially for military applications, but now they are used for commercial, scientific, recreational, agricultural, and other purposes. Dr Wickremanayake is the chairperson of Environmental Foundation Limited and also conservation scientist of WWF. He is assisting conservation work in Nepal. “We got down drones also with the aim of tracking poachers, but found that habitat mapping is a better application,” he said. Drones can be used to track Sri Lanka’s illegal cultivations of ganja for example. In Africa, drones have been used in anti-poaching operations, but this is a difficult proposition in Sri Lanka, he said, especially because of closed canopy forests. “However, opportunities to use drones in conservation are enormous. For example, we may use drones to control traffic in parks. Take Yala, for example, where adrone can easily detect areas that has problematic congestion and take action,” Dr Wickremanayake suggests. Drones can be used to address the conflict between humans and elephants. The Sri Lanka Wildlife Conservation Society under guidance of Ravi Corea in Wasgamuwa has begun research on how drones can be used in the conflict. WCSG research scientist Chandima Fernando said he noted elephants can be deterred by drones, but that the drawback is elephants raid farms at night, when operating a drone is a challenge. 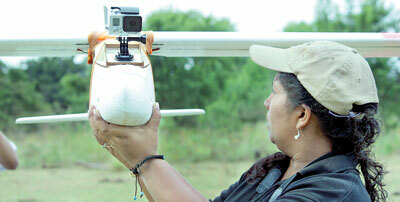 Dr Wickremanayake suggests that a network of pre-programmed drones be set up on the perimeter of villages. These can then be automatically activated in response to infra-sounds made by elephants. The drones can then help scare the elephants. “It is, of course, a futuristic project, but technology is available and it is a matter for an engineer to piece them together to present a practical solution” Dr Wickremanayake said. Fernando also worked closely with a research team in New Zealand’s Auckland University using drones for conservation and even locate injured elephants. In 2014, there was an attempt to introduce drones to wildlife applications. This was done by Tropical Ecosystem Research Network together with the University of Singapore. They mapped sections of protected areas such as the Horton Plains, Udawalawe, and Lunugamwehera. These experts say the Wildlife Department should explore the use of drones in their work. They also accept drones need to be operated based on rules and regulations. Fernando said that in New Zealand, permission is needed to operate drones. Drone can be used effectively in responding to natural disasters, as well. “During the floods, we used drones to find out paths of the floodwater. Dronescould be used in rescue missions. They can be particularly used for precision agriculture, or what is called smart farming,” points out Manju Gunawardana, a research scientist who studies use of drones in agriculture. Gunawardana and the team last year introduced a way to spray weedkillers in farmlands by first identifying where it is needed. “What is happening now is spraying agrochemicals evenly across a field irrespective of need. The use of drones can cut down agrochemical use,” Gunawardana said. The International Water Management Institute, too, has been experimenting with drones for a number of applications in Sri Lanka. The data management unit’s Salman Siddiqui told the Sunday Times that the institute studied how drones can be used to give farmers early warning of problems. “Using infrared sensors we can identify stress in a plant 10 days before the effects are visible to the eye. It could be water shortage, lack of fertilizer, or due to a pest attack,” he said. The institute also assisted the survey department to map Badulla town, which is prone to landslides. Drones have been used to map location of wells suspected to be linked to chronic kidney disease. Sri Lanka should be ready to use drones for various purposes with proper regulation, experts agree.